Gates of Vienna: Supersize This! As everybody knows by now, it was announced earlier this month that this year’s Nobel Peace Prize will be awarded to none other than the European Union. This can only further burnish the luster added to the Prize when it was presented to Barack Hussein Obama back in 2009. Both these momentous occasions were simply the latest in a long series of distinguished recipients, who include Al Gore (2007), Mohamed El-Baradei (2005), Jimmy Carter (2002), Amnesty International (1977), the United Nations and Kofi Annan (2001), Yasser Arafat (1994), Desmond Tutu (1984), and International Physicians for the Prevention of Nuclear War (1985). And indeed it has. But let’s not give up on the much-maligned Prize just yet. When the chips are down humor will always win out! Once again reality outdoes the Onion. They are out of chips Nemesis? 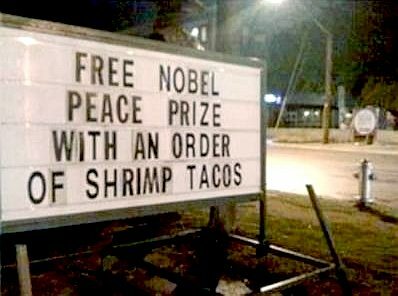 No wonder they are giving out Nobels. This has to be a typo. I'm sure the only prize the EU would get is Dhimmi Appeaser of the Year?? may have really happened at that island last year. Quite intriguing, really. I tried, but it's all too mysterious for me to figure out your meaning.